1 – Prednisone reduces inflammation and suppresses the immune system. 9 – Prednisone increases the risk of infections and decreases the effectiveness of vaccines and antibiotics. 11 – If you are taking prednisone and become pregnant, wish to become pregnant or are breastfeeding, you should alert your doctor. Prednisone is an important anti-inflammatory, an antirheumatic and antiallergic drug for the treatment of diseases that respond to corticosteroids, for example: endocrine, osteomuscular, rheumatic, collagen, dermatological, allergic, ophthalmic, respiratory, hematological, neoplastic and other diseases. respond to corticosteroid therapy. Prednisone should not be used without prescription and medical supervision. Prednisone is a safe medicine, but it is not free from important side effects such as weight gain, elevated blood glucose and cholesterol. What requires the patient in use of prednisone adherence to a lean diet, reduced salt intake and the practice of physical activity. It is important to know that treatment with prednisone (hormonal anti-inflammatory corticosteroid) should be prescribed by the attending physician (rheumatologist) and its monitoring should be careful, the use should be complementary to the conventional treatment of each disease. In rheumatoid arthritis Prednisone should not be used continuously. Corticosteroids such as prednisone are used in rheumatic diseases, are used to mimic the action of cortisol in the body, aiming to reduce inflammation and suppress the activity of the immune system. Prednisone is available as a tablet, a liquid or concentrated solution to take by mouth. Prednisone is metabolized by the liver, which after metabolization is converted to prednisolone by liver enzymes. People with impaired liver function may require a higher dose of prednisone to metabolize the required dose. The dose of prednisone depends on the medical indication, in rheumatic diseases, doses of 5 to 60 mg/day are prescribed and higher or lower doses may be prescribed, all depending on the medical indication, the dose of prednisone can be adjusted as the treatment progresses. It is common to indicate larger doses that gradually decrease, are called Corticoid Cascade. The effect of prednisone varies with dose, higher doses have faster results. Prednisone should be discontinued gradually, withdrawal of prednisone should be a shared medical decision, withdrawal occurs with doses that decrease day by day, to allow the adrenal glands to have time to recover, thus avoiding a crisis in the gland suprarenal, which is called Cushings syndrome. Prolonged use of prednisone can cause problems in the adrenal glands, which can atrophy and stop cortisol production. The most common way to take prednisone is a single daily dose taken with breakfast. Sometimes, however, the dose can be divided into 2 to 4 times a day. Whenever there is scheduling a surgery, tell the doctors that you use prednisone, according to surgery the dose of prednisone can be adjusted previously. alcohol, acetylsalicylic acid, hypoglycemic agents. When you go to a medical consultation with any specialty, please inform that you use prednisone. Side effects and decreased immunity with Prednisone are greater, depending on the dose, higher doses have greater side effects and decreased immunity. 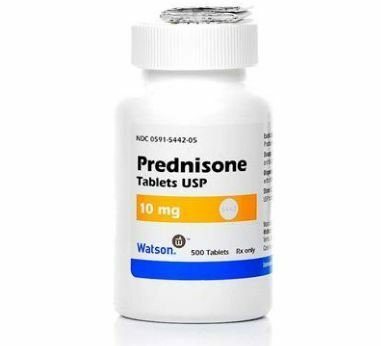 Prednisone is also an immunosuppressive medicine, it is common for you to have an easy infection since prednisone suppresses the immune system. The effect and efficacy of antibiotics and vaccines may be compromised, as prednisone dose, the higher the dose, the greater the immunosuppression and interference in the efficacy of antibiotics and vaccines. Higher dose and long-term use of prednisone may increase the risk of developing osteoporosis. Patients are usually advised to take calcium and vitamin D, and possibly one of the bisphosphonates. Talk to your doctor. Prednisone does not cross the placental barrier, in smaller doses, it can be used safely during pregnancy, but in high doses and mainly without medical supervision, can cause in rare cases cleft palate in the baby. Prednisone may be prescribed for breastfeeding patients, but the dose should be judicious and agreed upon by a pediatrician and a rheumatologist. I took tablets of 10 mg of prednisone for 4 days and m having terrible headaches during work. I have a history of pseudotumor cerebri and know this as a warning sign, so you have stopped the dosage. Does anyone know how long it takes prednisone to get out of your system? I have seen many and varied answers online and Im in a panic, trying to figure out if I need my neurologist usually stay. Edit: I should have specified I took 10 mg 4 times a day for four days. Talk to the pharmacist who filled the prescription. They will be able to give you accurate information. Previous post How Many Teeth do Humans Have? Next post Can You Live without a Liver?